Artist Joe Tomelleri captures the intricate details of 34 species of trout found in North American waters with life-like accuracy. This essential collection of elite angler quarry are dutifully presented on one delightful poster. With faithful attention to detail and representative in relative scale, each fish—from the tiny golden trout to the massive steelhead—is painstakingly replicated at 40 percent of average size. 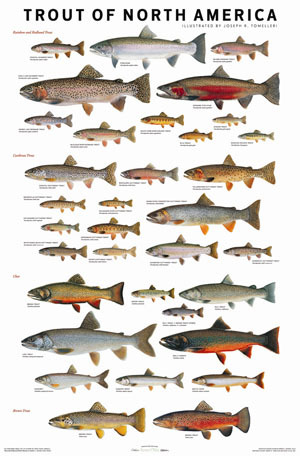 This gorgeous poster is a truly remarkable addition to any fisherman's functional art collection. Full color; 25x38 inches, 100 lb. paper stock.